ETNA Broker Back Office is a web platform for broker-dealers and digital advisors designed to automate business processes from client interfacing, accounts custodian to regulatory requirements and compliance reporting. ETNA Middle and Back Office powers broker-dealers and digital advisors with robust regulatory technology to ease the operations of an online brokerage or investment firm. Invest in what really makes a difference for business, while ETNA's technology ensures your business is running smoothly. Commission computation and adjustments on a per-user basis. ETNA Broker Back Office features a built-in reporting engine to automate reporting and compliance work including: regulatory reporting and essential business and financial reports. 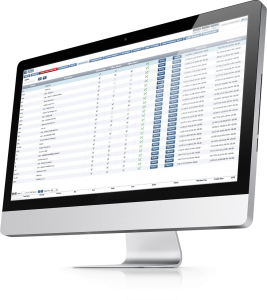 Our reporting engine allows back office specialists to set up new reports and configure existing ones. Automate OATS and regulatory reporting, or configure reports to comply with local laws and practices. Reduce risks and minimize the chance of human error by automating compliance rules and day-to-day manual operations. Ability to integrate 3rd party background checks (KYC) and market-manipulation scanners. A configurable alert system allows administrators, risk and compliance managers to set up events that trigger alerts in the system, such as approval before users pursue risky trading strategies. Our rule engine will reduce errors, uphold compliance, and adapt to specifications. Simple to use, it is fully configurable with manual or automatic blocking activity. Adjust your margins in real time for accurate and agile decision making via broker back office. With real-time calculations and effective notifications system, our clients discover potential client trading problems instantly. Set limits on which securities are tradable, how much can be traded, and even set dollar limits for each individual trade with automatic reject for orders outside of pre-set parameters. 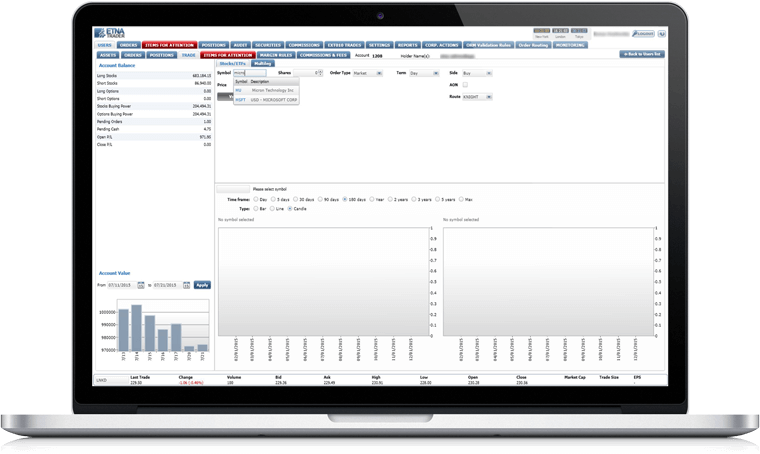 Security Master database simplifies the process of enabling and disabling the the trade of individual securities. Create orders via OMS API, ETNA Trader Web or Broker Back Office. Our stocks and options trading simulator is the perfect way to expose your platform to prospective clients without risk. Take advantage of our OEMS API to enhance the power of ETNA Trader and launch digital advisor within days. Using two or more of these authentications together has proven to dramatically decrease the likelihood of a security breach. Additionally, we employ standard security precautions like SSL and HTTPS.